This week, throughout the US, we have seen fear and anxiety up and down the east coast. It started when Tropical Storm Sandy formed in the Caribbean and worked its way along the east coast. Bringing varying degrees of destruction until it made landfall on the Jersey Shore. The coast of New Jersey along with Manhattan and Long Island, NY look like battle zones. What about fear and anxiety in your everyday life? In a typical week in your life – do you experience excessive fear and anxiety? Do you ever feel you are afraid too much of the time? Are you overly anxious? Many people have these feelings…. but there is a solution. 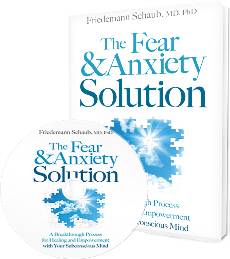 In November Dr Friedemann Schaub is touring cyber space to share details about his work and his new book The Fear and Anxiety Solution – A Breakthrough Process for Healing and Empowerment with your Subconscious Mind. Friedemann Schaub, MD, PhD, is a physician who has helped thousands of people to overcome fear and anxiety with his breakthrough and empowerment program that combines his medical expertise with NLP, Time Line Therapy™, clinical hypnotherapy, meditation, and more. The Fear and Anxiety Solution presents Dr. Schaub’s program for learning to understand, direct, and utilize the subconscious mind as our greatest ally on the path to health and wholeness. Through step-by-step guidance, Dr. Schaub explains how to transform fear and anxiety into healing catalysts that lead to greater confidence, self-worth, and success. “The more unresolved fear and anxiety you’ve stored in your subconscious, the more untapped potential awaits you,” explains Dr. Schaub. With The Fear and Anxiety Solution, you have the tools to change faster and perform better in every aspect of your life through the power of conscious-subconscious collaboration.